What would happen if you fed people only white rice, fruit, juice, and sugar? At up to 2400 calories a day? Would they gain weight, lose weight, or stay the same? The refugee with the strong German accent explained his ideas about renal failure to his skeptical medical students. “The problem with renal failure is the resultant metabolic dysfunction. The kidneys excrete waste products, amino acids, keto-acid metabolites, hydrogen ions, the salt that is eaten, and all these things are the result of what the people are eating. Theoretically, we should be able to make them better by reducing the amount of work the kidneys have to do. Namely, we could radically alter the patients’ diets and thereby save lives.” The (Duke University) students challenged the Herr Professor. “Sounds cool but prove it!” And so he did. The ideas behind this gallant hypothesis were not that novel. Others had prescribed various similar ideas about reducing renal work by modifying the diet, particularly in terms of sodium content. However, they had not been that successful in sending the kidneys on vacation. Kempner introduced the first comprehensive (global) dietary program to treat chronic renal disease. By doing so, he revolutionized not only that disease but also the treatment of hypertension, obesity, and a host of other disorders. Fruit and fruit juices are allowed. Dried fruits can be used as long as nothing but sugar has been added. White sugar may be used as desired (ad libitum); on average a patient takes in about 100 grams daily (400 calories) but, if necessary (to maintain body weight), as much as 500 grams (2000 calories) daily has been used. The nutrient breakdown is about 2,000 to 2,400 calories per day (depending on the patient’s body weight): 95% carbohydrate, 4 to 5% protein (20 to 25 grams), 2 to 3% fat (rice is relatively high in the essential fat linoleic acid), 140 milligrams of calcium, and 150 milligrams of sodium daily. His numbers also showed how a high-carbohydrate diet improved blood sugars and often cured type-2 diabetes. In the 1950s, diuretics were introduced for the management of high blood pressure. 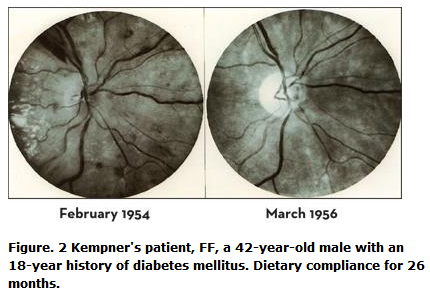 And still later the direct application of Kempner’s dietary regimen diminished as a large array of blood pressure medications — Beta blockers, ACE inhibitors, angiotensin antagonists, and calcium channel blockers — became available for the management of hypertension. 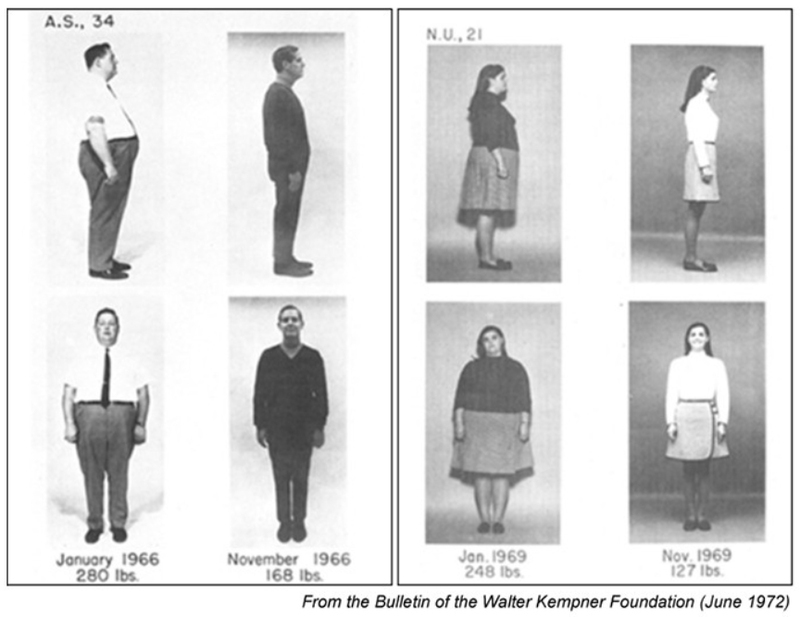 Kempner could take solace in knowing, nevertheless, that his regimen could provide comparable, if not better, results. 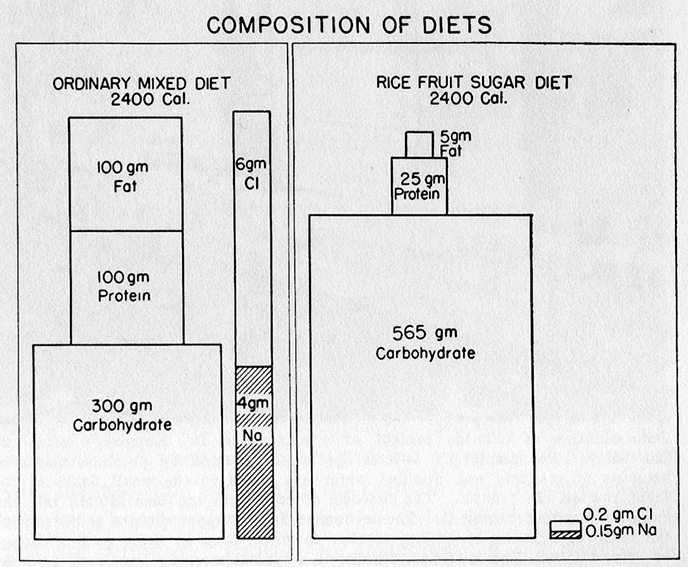 Many of today’s high-carb, plant-based diets are incarnations of Kempner’s rice diet from the 1940s. This entry was posted in Uncategorized on September 23, 2014 by Bix. If we are going to tax sugar because it causes obesity, we should also tax the foods Kempner’s patients were eating before they started eating sugar.